David Bauders, Founder & CEO Facing an enthusiastic audience, David Bauders, Founder and CEO at Strategic Pricing Associates (SPA) rightly delivers his major thought: “Pricing could make or break the future of a company.” A pioneer in the field of strategic pricing analytics and sales force training, Bauders regularly presents worldwide on pricing-related topics to leading distributors and manufacturers, helping them master the historic struggle to create the right balance between price, value, and profitability. “While historically companies based their pricing on the cost of production or their sales team’s best guess at their competitors’ pricing, today’s market-leading distributors and manufacturers deploy sophisticated analytics and skills training to optimize both their purchase costs and sell prices by customer segment, vendor, value drivers, negotiation leverage and even psychological and behavioral profiling,” says Bauders. Without the right analytical tools and skills training to both buy low and sell high, companies struggle to master these complex variables–their profits suffer and in many cases they will be acquired by the market leaders who have mastered this complex dance. Needless to say, the acquiring masters will dominate the terms of trade. It is no overstatement to say that a company’s future depends on how effectively it deploys the analytical tools and training to maximize value capture from the channel to invest in competitive differentiation and future profitability. SPA’s core mission is to enable complex companies to boost profitability through improved pricing strategy, profit analytics, and related skills training. Founded in 1993, SPA has worked with thousands of clients to master this simple but deceptively complex process across a broad range of industries to maximize their profitability and market position. Through SPA’s strategic partnership with Epicor, a leading technology provider for the distribution and manufacturing industries, SPA has further enhanced its position, enabling Epicor’s customers to directly leverage the benefits of SPA’s pricing analytics within their ERP platforms. The Epicor-SPA Strategic Pricing module, which was developed through an exclusive collaboration with SPA, facilitates the native development, deployment, and ongoing management of a client’s price-optimization engine. By deploying the SPA pricing analytics engine directly into the Epicor ERP platform, clients can easily install and maintain their pricing structures with industry-leading speed and reliability. Beyond the core price optimization engine, SPA also offers valuable workflow tools related to contract management, vendor cost management, mobile CPQ tools, and BI reporting tools to track ROI and create standards of accountability in the organization. The usual impact of both buy-side as well as sell-side analytics is additional profits equal to 2 to 4 percent of affected revenue, or $2 million to $4 million per year for every $100 million of affected revenue. Clients should expect to see these improvements in as early as 30 days post implementation. SPA has played a crucial role in changing the landscape of pricing strategy with its strong platform of proprietary analytics that integrates a client’s marketplace knowledge and its transactional invoice data to quickly and efficiently deploy an optimized pricing engine–buy-side for procurement as well as sell-side for sales reps. The optimized pricing engine helps clients to improve customer- and product-level price structures, as well as the consistency of execution. To optimize a client’s profitability, SPA identifies under-priced customers and products and deploys the pricing engine to correct that leakage–at the pace and rate which make sense to the client. “We help clients spot leakage points in their pricing, and master their pricing process,” states Bauders. With a full suite of analytical tools, SPA allows clients to continuously measure their ROI from their price optimization initiatives. Beyond the usual sell-price, buy-price, vendor rebates and contract pricing areas, SPA tools also improve freight recovery and small-order policies as well—an area where industrial companies often leave money on the table. To help clients quickly harvest low-hanging fruit, SPA has recently collaborated yet again with Epicor to introduce the Strategic Costing solution, which allows companies to gain 1 to 2 margin points on affected revenue within just one week. This tool fixes broken cost fields within the ERP system to help sales representatives make more accurate margin-based pricing decisions–before tackling the more complex change-management issues around pricing guidelines and negotiation skills training. It’s a quick, efficient, profitable launch-point for a larger, long-term pricing initiative. “By applying SPA pricing architecture, clients can improve profitability by two to four percent of sales as of purchases, which means $2 to $4 million per $100 million of affected revenue or spend,” says Bauders. Not a bad return on investment for two to four weeks of staff time invested over a 90-day implementation cycle. For instance, an HVAC distributor that serves contractor, industry, and institutional customers throughout Connecticut and Western Massachusetts sought to improve the margins in an increasingly competitive market. On implementing the Epicor-SPA Strategic Pricing module, the distributor realized an impressive margin improvement of 4.9 percent on 30 percent of its sales that in turn yielded an overall margin increase of 1.5 percent that went directly to the company’s bottom line. With SPA’s ongoing support, the company has sustained and grown this figure for almost a decade! In manufacturing, a Fortune 100 industrial company deployed SPA’s pricing analytics and negotiation training to sustainably drive over $200 million per year of incremental profit across diverse global geographical and vertical markets–for over a decade. Not surprisingly, its share price, competitive position, and marketplace vitality far outpaced its industry peers. In addition to offering unprecedented bottom-line improvements, SPA stands alone in its ability to help clients build profitable pricing architectures within their own enterprise systems. The seamless integration of all these tools by SPA with the associated ERP platforms improve reliability, workflow integration, and performance. This integration also saves time and staff bandwidth, unlike rival pricing software companies that sell complex, time-consuming, expensive integration projects. Success at pricing performance, however, demands more than just technology. It requires effective negotiation skills on the part of customer- and vendor-facing employees to drive analytical tools’ recommendations into real-world, profitable business relationships. Typically, salespeople are trained to sell, and buyers are trained to buy–but amazingly over 90 percent of each group has never been professionally and continuously trained to master the complex art and science of negotiation. While buying and selling skills provide one component, the long-term mastery of negotiation is critical to the real-world ROI from profit analytics. Understanding the critical impact a well-designed training program has on the ROI from pricing analytics, SPA in 2015 launched a new business unit, SPASIGMA, focused on the behavioral dimensions of profit mastery. With SPASIGMA, the company brings its unrivaled background in analytics and mobile app development to professional negotiation training. SPASIGMA has brought leading academic and industry negotiation masters together to create a unique mix of multimedia live and virtual training, case studies, role-playing, gamification, Learning Management Systems (LMS) and negotiation apps to make the training interesting and engaging. SPASIGMA offers a systematic, holistic, and long-term approach that professional business people need to achieve true mastery of this critical skill set. “Success is what happens when state-of-the-art training meets an engaging retention platform, all supported by mobile tools and proven analytics,” says Bauders. The key to real ROI from training investments is understanding and mastering the formula: Learning ROI = Participation Rate x Learning Level x Retention Rate. Most hard-skills training programs fail to deliver real ROI at the level of being interactive, engaging, efficient, and entertaining. People either don’t engage, don’t learn or don’t retain the material if it’s in a Death-by-Powerpoint format. In today’s fast-paced, modern world, professionals expect training to be impactful, short (less than 10 minutes), daily, and entertaining. While this expectation is daunting, SPASIGMA has invested heavily in negotiation expertise, creative content teams and virtual, mobile platforms to drive real improvements in negotiation skills–in an on-demand, engaging, mobile-friendly, edutaining environment. No more Death-by-Powerpoint! 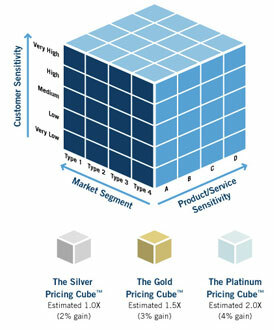 "By applying our pricing architecture, clients can improve profitability by two to four percent of sales, which means $2 to $4 million per $100 million of affected revenue"
To master pricing excellence, SPA has created a time-tested pricing methodology that includes negotiating strategy and tactics, value-based pricing, automated decision-making tools, customer profitability improvement plans, pricing strategy and leadership, with a truly optimized sell-side and buy-side pricing architecture. A pioneer in the field of strategic pricing with over 25 years’ experience, SPA plans to extend its leadership position as the go-to resource for profitability performance for distributors and manufacturers by continuously driving and executing on a robust solution roadmap on both the analytics and the training front. On the analytics side, SPA envisions to expand the breadth of its offerings. “One of the most interesting areas that we currently work in is benchmarking. The vast number of clients we have in certain verticals enable us to benchmark their performance within a group of competitors and pinpoint the areas where they are underperforming,” says Bauders. SPA’s strategic, market-based, and disciplined pricing architecture is the ‘go-to’ solution for distributors and manufacturers to leverage and manage pricing and profitability to increase their company’s value. On the training side, SPA envisions expanding its virtual training program, making more of its content on negotiation and profitability training available on microlearning platforms. “We are passionately committed to online learning and have created a learning management platform that enables us to track the performance mastery of this critical profit-driving content,” says Bauders. SPA is committed to deploy additional profit-boosting curricula via learning management platforms that will help companies ensure that their employees are not only continuously exposed to the training but are truly deriving ROI from it.